I have two chapters in this book about Ray Bradbury. The book is part of Salem Press’s Critical Insights series. Toward the end of last year I was invited to write a biography and a critical context entry about Ray Bradbury for inclusion in Salem Press’s Critical Insights: Ray Bradbury. The book has been published and I received my author’s copy last week, just in time for the holidays. It’s a lot of work to research and write these kind of articles, but it’s always a pleasure to see them in print and to see what kind of other articles there are in the book. Odd things like that seem to happen to me fairly often. I suppose I could claim to have had an intuition about the book, but I think I was drawn to it because I’ve been thinking about rereading some of the books I read as a teenager, and The Martian Chronicles and Fahrenheit 451 were both on that reread list. I read both while working on the articles, and in fact I devoured them each in a day or two, staying up way too late because I just could not put the books down. I don’t remember that fascination the first time I read the books, and in fact I found The Martian Chronicles a bit hard because I’m more of a novel reader and less of a short-story reader. I always wanted to stay with Bradbury’s characters longer than he did! My essays are a short biography, “Ray Douglas Bradbury,” and a longer piece, “Big Brother, Little Sister: Ray Bradbury, Social Pressure, and the Challenges to Free Speech.” You can work out from the title what it’s about, so I won’t go into details here. But, I would recommend reading Bradbury’s work, especially if you’ve only seen the movies. His word choices, the characters, the pacing of the stories — those are part and parcel of the atmosphere he brought to the worlds he created. You won’t go wrong spending an evening, or a few days, immersed in his work. 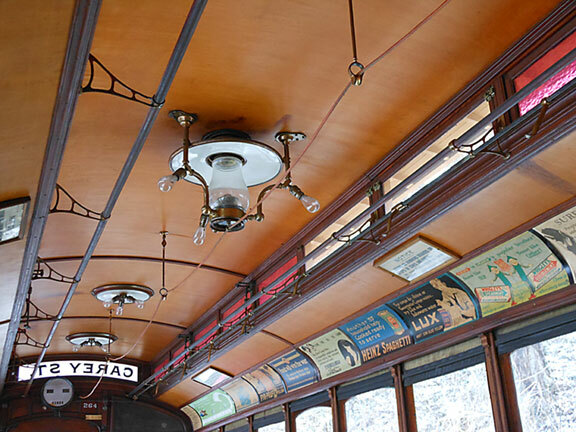 Interior of trolley at the Baltimore Trolley Museum. Welcome to this week’s Thursday Writing Prompt. I resisted the impulse to post a snow picture because I think more than a few of us are sick of the cold weather. But what would happen if we were permanently stuck with this weather? Suppose you lived on a planet where this is the way it is all the time. Winter isn’t just coming; it’s here. And it’s here to stay. Write a short description of a planet where this weather pattern is the norm. Assuming the inhabitants have similar needs to us as far as their needs for air, water, food, and warmth, what adaptations would they have made to deal with their planet’s climate? Do they have something like cars, or do they use sleds? Flying machines? Are they that advanced?